You’ve heard the old saying right? … Well, it’s true. And I’m reminded of it at least once a week, when I interview an inspiring author, entrepreneur, or thought leader on my show. I ask my guests a series of questions about what contributed to their success and ability to become such great leaders. You want to know what nearly every single one of them tells me? They read books. Books are like training weights for the brain. And reading the right ones can provide you with powerful leadership lessons in a very short period of time. 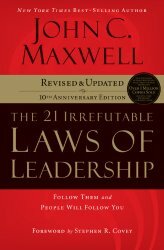 In this list, we’re going to go over 25 powerful books on leadership. Written by the most prolific management and leadership writer of his time (and perhaps, of all time), Peter R. Drucker, this is the definitive guide to getting the right things done that every leader needs to read. Get the book here. Or pickup the book summary here. 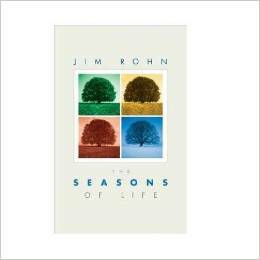 Jim Rohn was one of the greatest speakers and storytellers to have ever lived. Period. His books and teachings on leadership and business focused on the fundamentals of human behavior and how they have an impact on optimal performance, personally and professionally. My favorite thing about Jim Rohn’s work is his ability to take complex ideas and simplify them such that anyone could understand and apply them for immediate results. 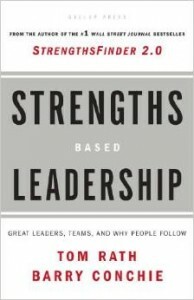 Read this book for powerful lessons in leadership and a primer on living well. “A Modern Fable on Real Success in Business and in Life.” The reason why this is such a powerful leadership book is because it gets down to the nitty gritty of some of those easily overlooked qualities of leadership: modesty, consideration, empathy. When those you lead begin to see you actually living the values preached by the organization or team you’re leading — that’s when you can lead without a title. Because that is when you can be confident that you’ve gained more than mere compliance; but respect. Get the book here. This isn’t your typical leadership book, but it contains some profound leadership lessons that most books in this genre simply don’t. 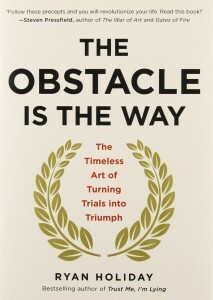 Read along as the author pulls powerful leadership insights from thought leaders and Stoic Philosophers — all of which, oddly enough, are just as applicable in the modern workplace, as they were thousands of years ago. Grab this book of old-school leadership lessons here, or checkout the book summary here. Behold, The 21 Irrefutable Laws of Leadership — follow them and people will follow you. This is a powerful set of principles written by one of the foremost minds behind modern leadership thinking, John C. Maxwell. All 21 “laws” are very easy to understand, and the stories that support them make each of them actionable for us to apply within our own lives and individual leadership roles. Written by the people who brought you StrengthsFinder 2.0, the good folks at Gallup have also been focusing on the topic of leadership. And after studying over 1 million teams, and conducting more than 20,000 in-depth interviews with leaders, they’ve come out on the other end with more than just a few big ideas on leadership. 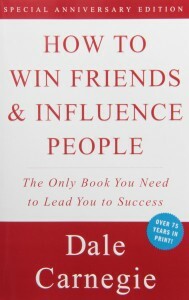 Read this book to learn about great teams, and great leaders, and why people follow them. Complete with a testimonial by The Dalai Lama himself, Emotional Intelligence 2.0 provides you with a modern handbook of research-driven rules on connecting with others and building relationships to help you lead. 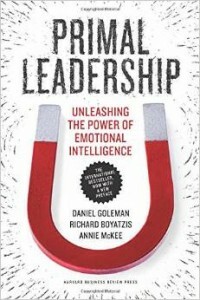 The book also comes with an emotional intelligence test to help you determine where you should focus to become a more effective and well-esteemed leader. Want to learn how to leverage exponential technologies to accelerate growth like you’ve never seen before? 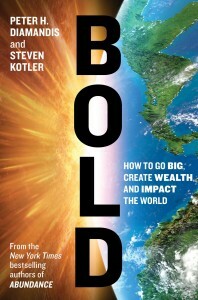 Bold is the leadership book for you. In this powerful book, you’ll learn about using exponential technologies, moonshot thinking, and crowd-powered tools to create extraordinary wealth while you make a meaningful difference on the world doing work that matters… Expect to learn new and unconventional methods to leveraging the web’s infinite tools to raise money, make money, and manage money. Get the book here, or listen to the audio summary here. Why is it that some teams pull together, and others don’t? You’ll learn the difference in this superbly written book with stories peppered throughout. 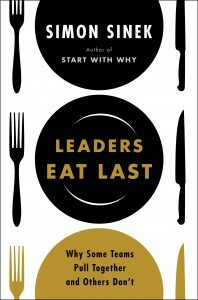 In Leaders Eat Last, author Simon Sinek asks us to imagine a world where almost everyone wakes up inspired to go to work, feels trusted and valued during the day, then returns home feeling fulfilled… this is not some idealistic dream, Sinek says, but something that is actually happening in various organizations across the United States. Get the book here. 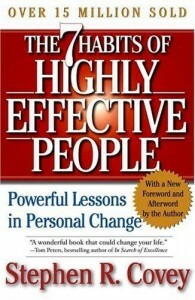 The 7 Habits of Highly Effective People is one of the most popular personal development books ever published. 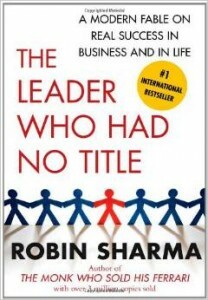 Essential reading for every leader. 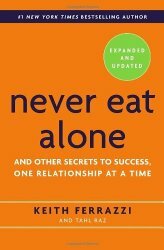 The subtitle says it all: Powerful Lessons in Personal Change. It’s true. Both in life and in business. 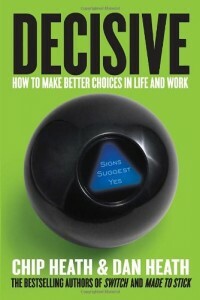 The author, Dr. Stephen Covey, provides research-driven advice gleaned from decades of data on what it takes to become as effective as possible across every dimension of life. 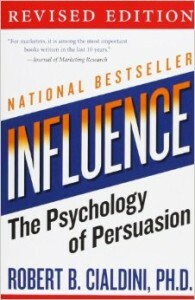 Successful businesses and organizations are built by successfully selling quality products, programs, and/or services to large numbers of loyal customers… Successfully selling to these customers requires an individual to possess the knowledge + skills of effectively influencing “browsers” into becoming “buyers.” In his landmark book, “Influence”, Robert Cialdini breaks this down to a science (literally). 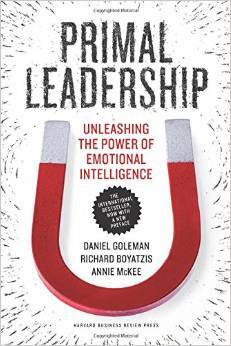 In the book, you’ll learn vital leadership lessons to help you persuade people more effectively. Pay particular attention to “The 6 weapons of influence”, and how to utilize them in order to persuade and lead people in a scientifically sound way. Why is it that some leaders can take companies into the multi-million (or billion!) dollar level and beyond — and others struggle to lead the customer service department? 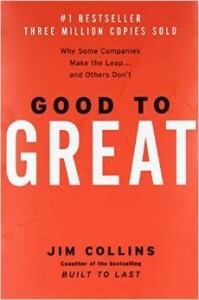 Find out in Good To Great as author Jim Collins guides you through the best leadership practices deployed by the best businesses, companies, and organizations around the world. If you aspire to lead a company to greatness, than this book will provide you with the requisite leadership lessons to do so. Another classic by Dr. Covey on the values and virtues of true leadership. 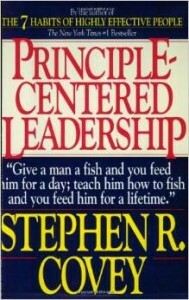 InPrinciple Centered Leadership, Stephen Covey gives examples of some of the greatest leaders from around the world and what they did to become so influential. In the book, he covers how these leaders would bridge gaps amongst people who might otherwise hate each other. And he shows us how to do it through meaningful communication strategies and gentle persuasion. This book is best consumed via audiobook (I’ve probably listened to it over 100 times, and because it’s only about an hour long, you may end up doing the same thing too.) But if you prefer books, you can always go that route instead. This book is packed with some of the most powerful leadership lessons you’ll ever learn. Author Daniel Pink debunks some of the biggest myths about what really motivates us at work; immediately putting Drive on every serious leader’s reading list. 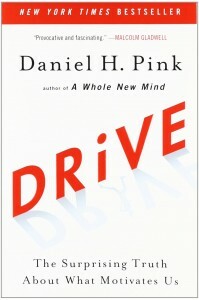 Drive describes the characteristics of extrinsic and intrinsic motivation — and how far too many organizations rely on extrinsic motivators, even though these are often counterproductive. Instead, Pink explains how we can best motivate ourselves and others by understanding how to utilize intrinsic motivators. Bottom line? You can’t lead anyone unless you know what moves and inspires them, and Drive is a cornerstone book on how to figure that out. 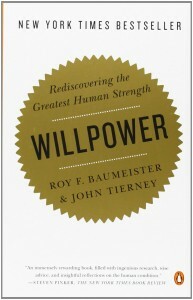 This book aims to re-ignite a conversation that leaders have been ignoring for decades: what’s the role of willpower in a high-performance work environment? The answers will surprise you. They’ll also provide you with actionable ways to reshape your lifestyle and leadership in a way that allows you to lead with your strengths, as well as help others find and ignite that charge within themselves. Most people operate as either takers, matchers, or givers. 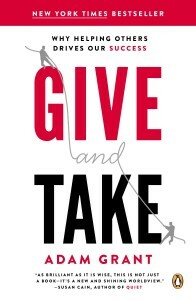 Whereas takers strive to get as much as possible from others and matchers aim to trade evenly, givers are the rare breed of people who contribute to others without expecting anything in return. Adam Grant takes a deep dive into why helping others drives our success in life and business. Packed with profound and powerful lessons in how strategic giving and contribution helps us get ahead — both personally and professionally. Get the book here, or pickup the summary version here. The surprisingly simple truth behind extraordinary results? Focus on your ONE thing. If you can cultivate the habit of doing this, you’ve already harnessed one of the most powerful leadership lessons out there. 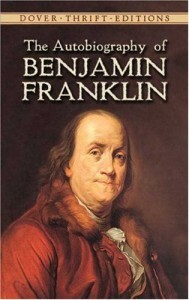 If you haven’t, then go get this book. 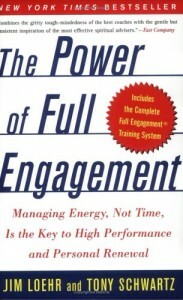 The authors of The Power of Full Engagement say that the real key to high performance isn’t about managing your time – it’s about managing your energy. Because let’s face it — no matter how powerful your leadership title says you are, you’re powerless without your health and wellbeing. When you break it down to the basics — you find that this book provides us with a much needed crash course on a much needed topic: well-being. Great leadership requires great decision making. If you’re a leader, and you make the wrong decision, you’re steering a whole lot of people in the same direction… People that depend on your leadership to help them succeed. 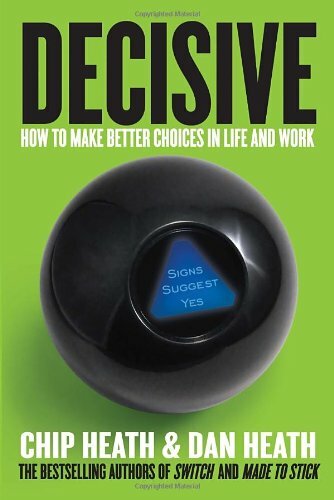 In this book, the Heath brothers provide the leadership lessons you’ll need in order to make better choices in life and at work. The most powerful leadership lessons in this book are about building the future without being too concerned about what people think, or feeling like you’ve got to mould inspiring ideas into another boring business. 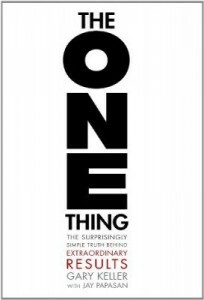 Zero To One is a powerful book about leading the future — both in technology and otherwise. 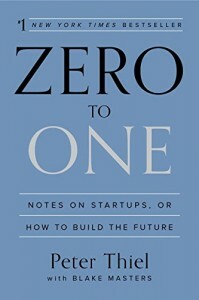 And because of its focus on building a brighter future for humanity by way of innovation — Zero To One also makes for excellent reading for leaders looking for better answers in the world of technology and business. Pick it up here. 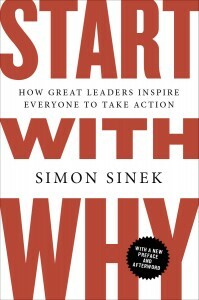 Simon Sinek’s first book on leadership was an instant hit, because it gave easy-to-understand examples of how great leaders like MLK and the Wright Brothers defied the odds and inspired people to take action… and getting people to act, let alone inspiring them in the process, is one of the most difficult, but powerful leadership lessons anyone can learn. This book teaches you how… and why. Primal Leadership. Cool title, eh? 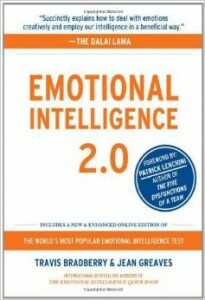 This is the original book on emotional intelligence, right here. Pick it up and learn classic lessons in dealing with people through empathy and understanding (it’s more powerful than you think.) The depth at which the authors get into the neuroscience of influence and impact is incredibly interesting. And they become especially powerful when you connect these insights to how you lead others. Who could forget this classic? How To Win Friends & Influence People will teach you some of the most powerful leadership lessons in dealing with people elegantly — even when dealing with the worst of personalities.